Your little prince or princess is (nearly) all grown up, and is off to college this year. Not an easy time, is it? Your help may still be needed, but it's unlikely to be greatly appreciated. And you can expect fireworks at the mere suggestion of interference. Hint in the mildest possible terms that, while the apple of your eye is packing for freshman year, he or she might choose to find room for a few pencils and books among the sports equipment, weird clothes and electronic gadgets of unfathomable purpose, and you could be on the receiving end of a hormone-fueled rage that could leave you scarred for life. So you'd be forgiven for deciding that discretion is the better part of valor, and that silence is the best policy. However, there's one topic about which you really have to make your voice heard. And that's how your kid is going to manage his or her finances at college. Chances are that your beloved offspring would like you to cosign a credit card application so that he can get his hands on a proper, grownup piece of plastic. And that may well be the best solution for him. But it may well not be the best for you, the cosigner. You know your child. Has her piggy bank been full since her third birthday? Does the balance in her savings account make you gasp in an admiring rather than a despairing way? Does she negotiate a usurious rate when people ask her to lend them money? If you can answer yes to all of these, then you're probably as safe as possible in cosigning a credit card application. But if your child is eternally short of cash, always borrowing against next week's allowance or occasionally comes home with bruises from the schoolyard loan shark, then you owe it to him and yourself to refuse to be a cosignatory. He doesn't know how to manage money now, and it's unlikely that he'll undergo a conversion to prudence en route from his current bedroom to his college dorm. Cosigning for credit cards is a serious step. Depending on the agreement to which you attach your John Hancock, you could find yourself on the hook for thousands without any warning of the mounting credit card debt you've taken on. And you could find your phone permanently off the hook as you're harassed by auto dialers owned by collection agencies that have every legal right to expect you to cough up. Meanwhile, you could find your credit score in free fall. Worse, some cosigning agreements have no end date. It's one thing to support your perfect 18-year-old daughter as she takes her first faltering steps into the outside world. But how would you feel if you were still responsible for her credit card debt when you're retired, and she's a 40-year old gambling addict who has shacked up with a crack dealer in Las Vegas? Not all cosigning agreements are as strict as this, but you really, truly, honestly need to read the small print before you sign one. 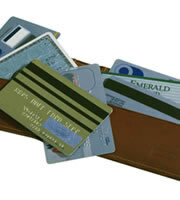 Debit cards: As long as there isn't an overdraft facility, these should prevent excess. However, they don't usually allow youngsters to develop their own credit reports and scores. Secured credit cards: These require an upfront, returnable deposit (like a deposit on a rented apartment), and that amount becomes the credit limit. So there are few opportunities for irresponsible spending, and many of these secured credit cards report to credit bureaus, so your child can begin to build her own credit report and credit score. Prepaid cards: In theory, these are little different from cash, and should be perfect for those students who are most likely to go off the rails. However, they sometimes come with hideously high hidden fees, so take great care when choosing one. It's important to recognize that none of these alternatives normally provide the same statutory consumer protections as proper credit cards. However, you may well feel that that is a small price to pay for your own peace of mind. So far this article has tended toward the assumption that the fruit of your loins has turned out to be something of a financial lemon. Not that there's anything wrong with that. It's early days, and Bernie Madoff was probably a model of financial probity at 18 or 19. Few parents want to refuse their kids anything, and there's little in life that's likely to make you happier than feeling able to cosign for one of the student credit cards that are currently available. However, refusing to do so could be among the kindest and purest forms of tough love. 0 Responses to "Student credit cards: A parent's perspective"